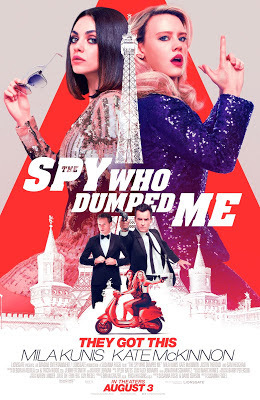 The Spy Who Dumped Me is a brand new action comedy starring Mila Kunis and Kate McKinnon as two best friends who get entangled into an international conspiracy when one of the women discover that their boyfriend was a spy. Now I went into this film honestly thinking it was a romcom… due to the fact that I haven’t seen a single trailer for this film and just knew the title and who was in it. Which if I were to sum up this film in one word it would be surprising. The film honestly surprised me. Not only the fact that it was an action comedy, but it made me laugh, giggle, and gut bust laugh at least a couple times. Plus might I say the action in this film is fantastic. I love when comedies that do have action take it serious and make it fantastic to watch. A lot of the success of these things goes to the director Susanna Fogel, who once again needs to helm an action film of sorts.. A HARD R ACTION FILM, because that is what she did so well was directing the R rated action in this film. Now I put an emphasis on R rated action, and that because this film is rated R and it's not just due to the language but mostly for the action. It’s nothing grotesque or over the top. It is just very much intense. Which is what can be said for the pacing it was fast paced film that gets where it’s going and just continues from there. Mila Kunis does a great job as always and Kate McKinnon who at times does go over the top I think went the right amount over the top for this film. A lot of the success of this film must go to the director for accomplishing the laughs, the action, and overall a good time at the movies. Now this is no cinematic masterpiece there’s issues with the film and I acknowledge this, but for me the point of a comedy is to do two things. Entertain me, and make me laugh. The film did both of those which is why I can throw my nitpicks of the story being a little too convoluted or even predictable and stupid. This film for me is the surprise film I didn’t expect to like at all. It might just be me that liked it, but it worked for me and I hope it works for you too.